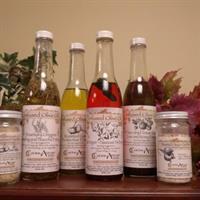 Cucina Aurora is a small, woman owned, local business. Every time you purchase Cucina Aurora products on our website or by visiting a retailer in your neighborhood, you can rest assured you are getting the highest quality, handmade, gourmet cooking products for you and your family. We encourage people to cook together, eat together and learn about each others lives around the dinner table. By using Cucina Aurora’s products, already infused not only with flavor, but with love, you can make quick, easy and healthy meals you can bring Meal Time Magic to your table every day.